Ugh. The clocks have gone back. While it was lovely to get an extra hour in bed (if you were lucky! ), it does signal the arrival of the winter months when it’s sooo much harder to prise yourself out of bed in the dark. We all understand the importance of getting a good night’s sleep to your health and wellbeing, but did you know that how you wake up is also really crucial to how we feel for the rest of the day? So how do you wake up when it’s dark, and your duvet is oh-so-snuggly? 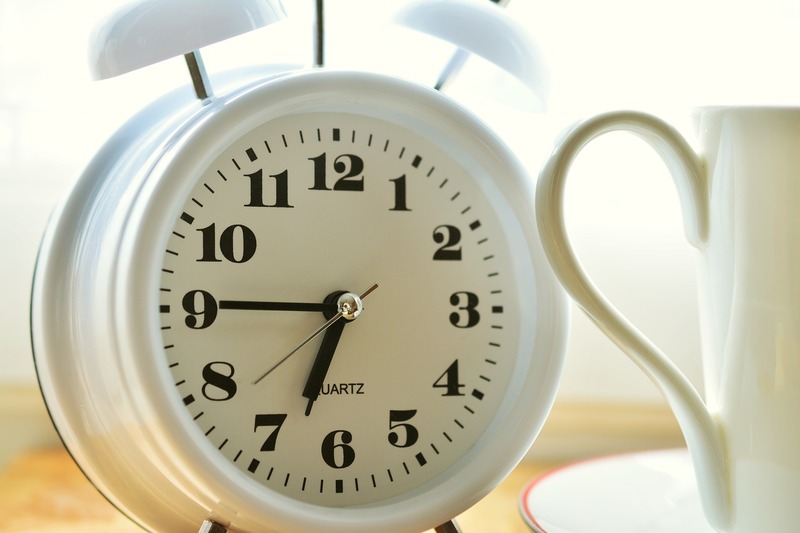 Here are a few things you can do to help make waking up in the dark that little bit easier. Very simple but also very effective. Think about how dehydrated your body is when you wake. Start your day with a drink of water (preferably room temperature) to hydrate you and make you more alert. When you have kids, it’s unlikely you often get to hit snooze but if you do get the opportunity for a few more minutes of zzzs, try to resist the temptation! Dosing in and out of light sleep is not great for your body and you’re not likely to feel any more refreshed. It’s much better to try and keep those eyes open if you can. The same applies if you naturally wake up a little before your alarm. Don’t try to get back to sleep – instead, have a big stretch and a yawn, get out of bed, and get your day started. Much like children love a routine, so do our bodies! Experts agree that it’s better for our health and wellbeing if we try to stick to a regular wake/sleep cycle. Try to head to bed at a similar time every night, and try to wake at a regular time in the morning, even at weekends. I know I harp on a lot about getting enough sleep but it’s so important people! If you’re getting the sleep your body needs (and while it’s different for everyone, around 7-8 hours is what you should try to aim for) then waking up in the morning, even in the dark, shouldn’t be too much of an issue. Can you remember the last time you woke up feeling refreshed and ready for the day? If you can’t, then maybe it’s time to rethink your bedtime. We spend a lot of time and energy making sure our kids get the sleep they need – please make sure you’re getting your quota too. What do you love to do that would make you get up and out of bed? Is it yoga? Meditation? A freshly-brewed coffee? A favourite song? Whatever it is, get up early enough to fit it into your morning routine. If you wake up thinking about doing something you love, rather than the other mundane stuff on your to-do list, you’re likely to feel a bit more motivated to get up. Our bodies are designed so that our internal circadian rhythms (our internal body clock) align with sunlight. This produces cortisol (the stress hormone) when you wake. Although this sounds like a bad way to wake up, it’s not – it’s what your body needs to kickstart into action. In the winter months, there is no sunlight peeking through our blinds to gently wake us from our slumber. But just because it’s dark outside, it doesn’t mean you can’t wake up in the light. Look into buying a light therapy device for your bedside table that will simulate sunrise and gently wake you up. There’s nothing worse than forcing yourself to get out of your warm bed when the rest of the house is freezing. Set the heating to come on a little before you’re due to get up, so that leaving your bed is not such an unpleasant thought. This is my favourite way to wake up in the morning. I’m obsessed with my morning shower and it really helps to get me ready for my day ahead. To get the most from your morning shower, make sure your shower is high pressure. Shower pumps can help boost the strength of your shower, which is vital if your house suffers from low water pressure. Use a stimulating shower gel with a strong scent, such as mint or citrus fruits, to help wake you up. Splash your face with cold water afterwards, to really wake up your senses. Along with the obvious health and wellbeing benefits, sleep experts say that those who exercise regularly tend to wake up feeling better than those who lead more sedentary lifestyles. You don’t have to dedicate hours and hours in the gym if you don’t have time. If you can, try to fit in a few short workouts each week and you will start to feel the benefits when you wake. What do you find helps you to wake up and get out of bed in the cold, dark winter months? Please share your tips below. Disclaimer: In collaboration with Pump Sales Direct.